A few years back I bought some large VHF Broadside Antennas at a stock-take sale. So during one weekend, I thought I'd just weld up a stand and see if I could use them as a simple radio telescope. Using a WinRadio WR-3700e Wide-band receiver and small preamp, I scanned the VHF spectrum within the antenna's designed frequency range for a radio quiet area where I could conduct a meridian drift scan of the sky. After a week of scanning and logging, the quietest frequency identified was 231.58Mhz which was reasonably clear either side by about 1Mhz. The scans where conducted at a receive sensitivity less than 1uV, the bandwidth was 17Khz and was logged at 1khz steps, AGC (Automatic Gain Control) was disabled. The purple line indicates the maximum signal strength detected over the 24 hours and similar the green the average and orange minimum. Note that over the 24 hour period, some RFI interference occurred at different times of the day. Nevertheless this could be reduced using a band-pass filter at a latter stage. The audio of the receiver was connected to a computer using the sound card and was logged over 24 hours from 7pm to 7pm using the the famous amateur radio astronomer software Radio-SkyPipe and the results so far are not to bad for a first attempt. The antenna was aligned approximately by eye to line up with the sun as it passed over, if there are any extraterrestrial objects it is difficult to verify, as no planning at all was attempted. The next trace was recorded from 9pm to 9pm where the antenna was tilted directly vertical to zenith. The last is an example of the noise generated by heat in the equipment without an antenna over a similar 24 hour period. Note that the noise floor has been amplified significantly. 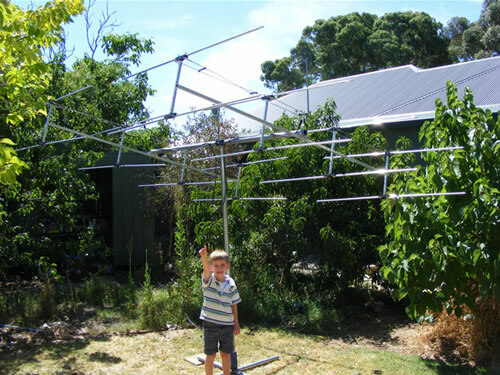 The two antenna where stacked to offer a 32 element collinear phased array and should in theory offers a gain of around 20dbi and a beam width of about 18 degrees. Although the gain may seem low compared with microwave radio telescopes the all important aperture size is over 4 metres square. Also note that galactic noise is very bright compared to microwave in the VHF spectrum.